Governor Jerry Brown brought his campaign to pass Proposition 30 to UCLA last week, reminding students that they could face a tuition increase if the measure fails. Prop. 30 would fund public education and services primarily by raising taxes on the state’s wealthy. The Daily Bruin published this interview with the governor. Yes on Prop 30 video that aims to make that point. A recent piece in the Los Angeles Times called Prop. 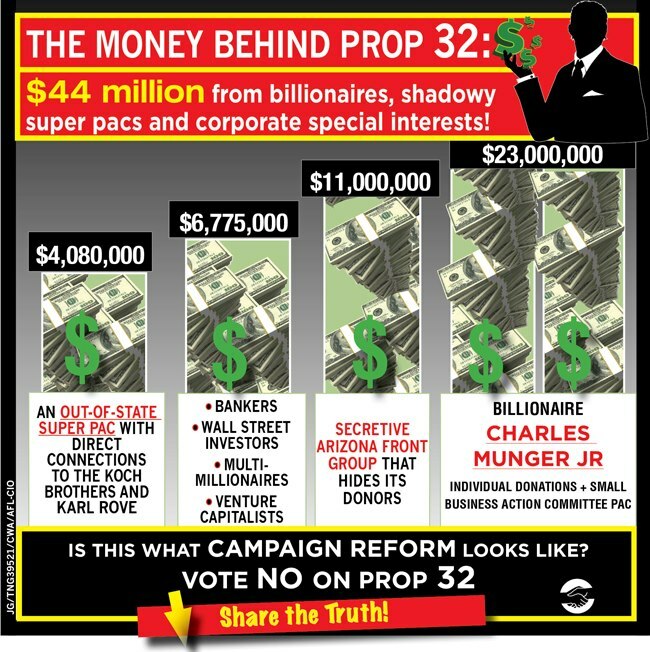 32 “a fraud to end all frauds.” Prop 32 undermines working peoples’ voices but exempts secretive Super PACs and corporate front groups, which can raise unlimited amounts of money for their candidates. Turns out the architect of the Prop 32 deception has a long history of trying to trick Californians into voting for measures that would ultimately give the 1% even more power at the expense of everyone else, writes Matthew Fleischer on the Labor’s Edge blog.